The Obama administration has another reason to hate Fox: it appears to be the only national television news outlet in America interested in the growing ClimateGate scandal. Despite last Friday morning's bombshell that hacked e-mail messages from a British university suggested a conspiracy by some of the world's leading global warming alarmists -- many with direct ties to the United Nations' Intergovernmental Panel on Climate Change -- to manipulate temperature data, ABC, CBS, CNN, MSNBC, and NBC through Monday evening have completely ignored the subject. LexisNexis searches indicate that NPR appears to also be part of this news boycott. CBS "Evening News" Sunday did lengthy pieces on the website FreeCreditReport.com not being free and the movie "New Moon"
NBC "Nightly News" Sunday reported the release of British singer Susan Boyle's CD, and then followed it up with another report Monday on her promoting it. It's not that these aren't valid news stories, but should they ALL be of greater importance than a scandal involving scientists from around the world including some employed by NASA and American colleges? Also consider that the news divisions of ABC, CBS, and NBC broadcast many hours during the day besides their evening programs, and LexisNexis identified no ClimateGate reports in those either (through Monday). As for CNN, it has been broadcasting for almost 100 straight hours since this story broke, and it appears the so-called "Most Respected Name In News" has yet to devote one second to this scandal. By contrast, Fox News did at least four reports on this subject on Monday alone. The Australian Broadcasting Corporation has also done multiple stories on this matter, as has BBC.com. Yet, despite the seriousness of this issue, as well as a prominent Senator calling for hearings to investigate it, America's television news organizations appear to be actively boycotting this growing controversy. Is this a replay of how they ignored September's ACORN scandal for many days until they were basically forced to cover what had gone viral across the Internet, talk radio, and Fox News? What is it going to take for these so-called news outlets to begin sharing this subject with their viewers? On a humorous related note, ABC might not be interested in ClimateGate, but it still is devoted to spreading climate fear. On Tuesday, ABCNews.com's top story was, "Worse Than the Worst: Climate Report Says Even Most Dire Predictions Too Tame"
There's even less time for humanity to try to curb global warming than recently thought, according to a new in-depth scientific assessment by 26 scientists from eight countries. Sea level rise, ocean acidification and the rapid melting of massive ice sheets are among the significantly increased effects of human-induced global warming assessed in the survey, which also examines the emissions of heat-trapping gases that are causing the climate change. "Many indicators are currently tracking near or above the worst-case projections" made three years ago by the world's scientists, the new Copenhagen Diagnosis said. Nor has manmade global warming slowed or paused, as some headlines have recently suggested, according to the report, which you can see here. Well, at least ABC is consistent. Readers are advised that of the cable news networks, only CNN produces transcriptions of all its broadcasts. With this in mind, it is possible that MSNBC has reported on ClimateGate during programs not transcribed. 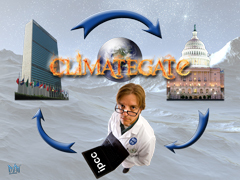 It is also possible that Fox News has reported on ClimateGate more frequently than addressed.